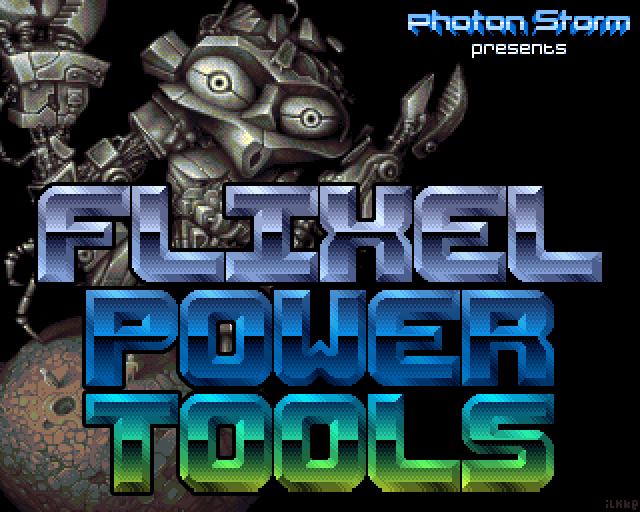 I’m pleased to announce that version 1.9 of the Flixel Power Tools is now live. This release was never about adding big sweeping new features. Instead I focused on maintenance and making it as solid as possible. Lots of the classes have been expanded and piles of bugs and edge-case oddities stomped. 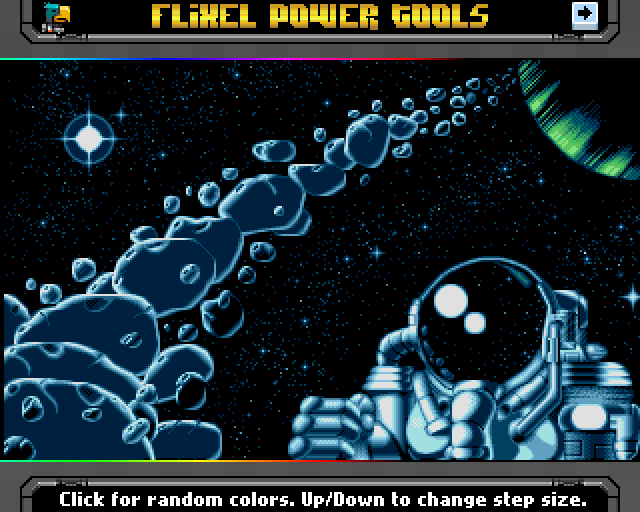 Updates include: Pixel perfect collision now works 100% even when both sprites are rotating.The new FlxKongregate provides a solid hook into the Kongregate API with all of their advanced features. FlxWeapon gained the ability for pre-fire and post-fire events, sound support, random factors, parent direction firing support, bullet elasticity, bullet counters and bullet lifespans. The control handler had some gravity issues squashed and new isPressedUp/Down/Left/Right methods added. 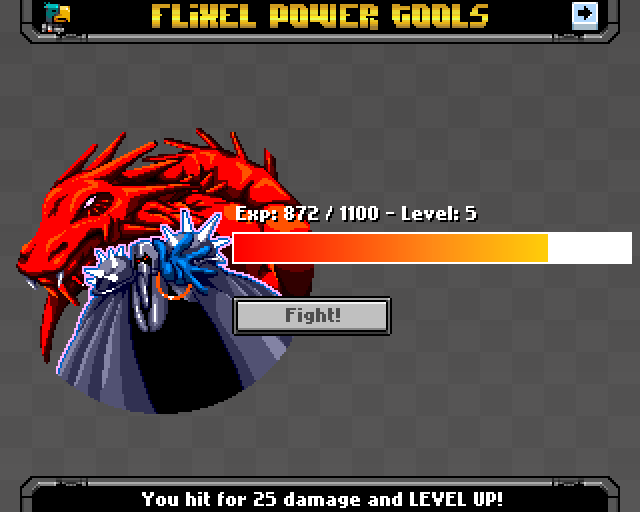 FlxBar had a complete overhaul and is even more flexible now, with 2 new RPG style examples included: A Zelda-like life counter and an RPG Experience bar. Plus there are new tests in the Test Suite including a destructible terrain example. Read on to find out what Version 2.0 will bring to the table. 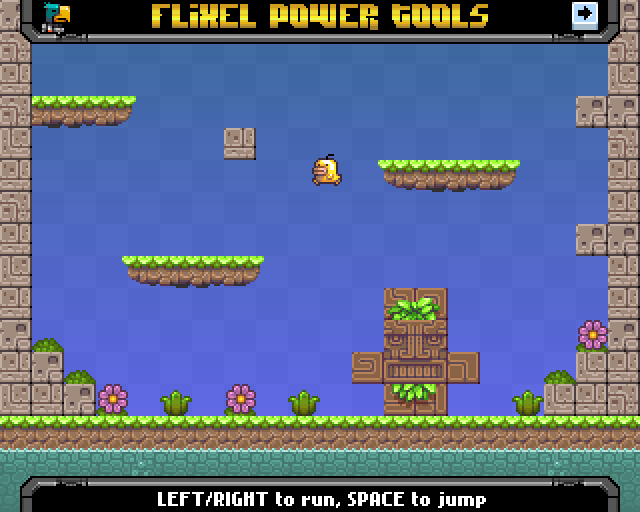 Tonight I pushed up the final v1.8 release of the Flixel Power Tools. There’s only really one major new class this time, but it’s a big one. 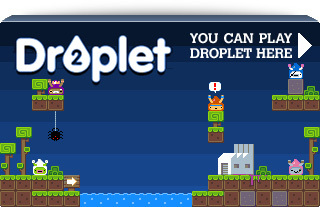 FlxExtendedSprite together with FlxMouseControl provide you with the ability to create FlxSprites that you can click with the mouse, drag around the game world, snap to a grid, throw or even hook to the mouse with a spring! It handles overlapping sprites with ease, has custom sort controls (to determine which mouse gets the click) and clicks can be bounding box or pixel perfect as needed. Dragging can be locked to a single axis or a FlxRect area too. The Extended Sprites also now have built-in gravity, which works wonders combined with the ability to throw them. There are no less than 14 examples in the Demo Suite to boot including a little mini-game. Also new in this release is FlxFlectrum, a powerful addition to FlxFlod, that allows you to create your own vu-meter / spectrum analyser style display for soundtracker music. Use the built-in meter or provide your own PNG, with direction support, column/row spacing, background beat and peak or meter display modes. Several classes have had new methods: FlxMath gained wrapAngle, angleLimit and mouseInFlxRect. FlxCollision received the new pixelPerfectPointCheck and the very handy createCameraWall, which builds an invisible collision wall out of Tile Blocks around the camera – you control the width. And last but not least a new FX: RevealFX. 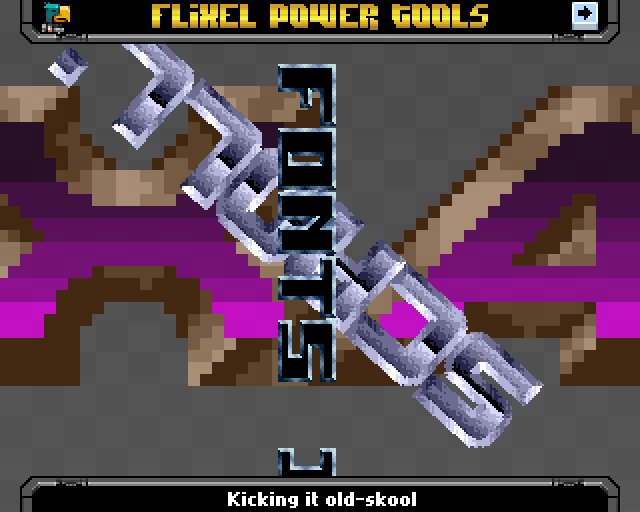 Flixel Power Tools v1.7 – Kaboom! V1.7 includes a brand new Demo Suite system (don’t forget to try the Credits button ). It’s now easier and quicker to get to the examples, which is just as well as we’ve over 60 of them in this release. Don’t forget to download the whole package from github, as it includes a Getting Started manual PDF, the full source code to all of the demos, all of the graphical and audio assets (warning: copyright, don’t use commercially! ), as well as the tools themselves. There are some great new tools and updates to nearly everything. FlxHealthBar is gone, replaced with the much more versatile FlxBar. This new bar can be used for anything, from progress meters to sprite health. It can fill in one of 8 different directions, can be hooked to a parent sprite and monitor any value of that sprite – in short it doesn’t have to be just a health bar any longer. The biggest new addition is FlxWeapon. 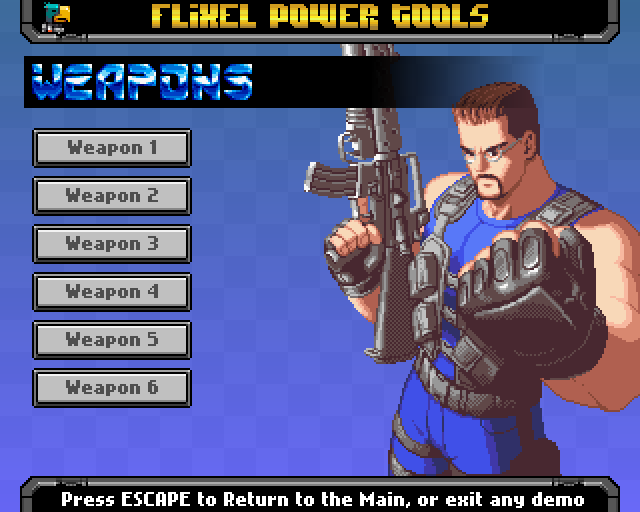 A comprehensive weapon manager for games. It handles creation, pooling and re-use of bullets and a heck of a lot more. Angled bullets, sounds, callbacks, fire at the mouse, fire from the mouse, fire from a parent sprite, fire from a fixed position, bullet speeds, firing rates and more! Combined with FlxControl this is a ninja combo. FlxVelocity has been updated with lots of new functions: moveTowardsPoint, distanceToPoint, angleBetweenPoint, velocityFromAngle, accelerateTowardsObject, accelerateTowardsMouse and accelerateTowardsPoint. And FlxControl now supports rotation, thrusting and reversing. Basically you can make an asteroids style ship movement in a couple lines of code Of course I couldn’t resist adding some new Special FX including Blur, Center Slide and Sine Wave. Enjoy! I’m really happy to have finally pushed v1.6 of the Flixel Power Tools from dev to master! The major new class is FlxControl. On the surface it may seem a bit pointless, after-all keyboard controls in Flixel are dead easy, right? But it actually wraps those up with the FlxSprite motion and physics. This means you just tell it how many pixels/second you want the sprite to move, and it’ll do the rest! Maximum velocity, acceleration, deceleration, gravity, firing, jumping and flipping all supported. 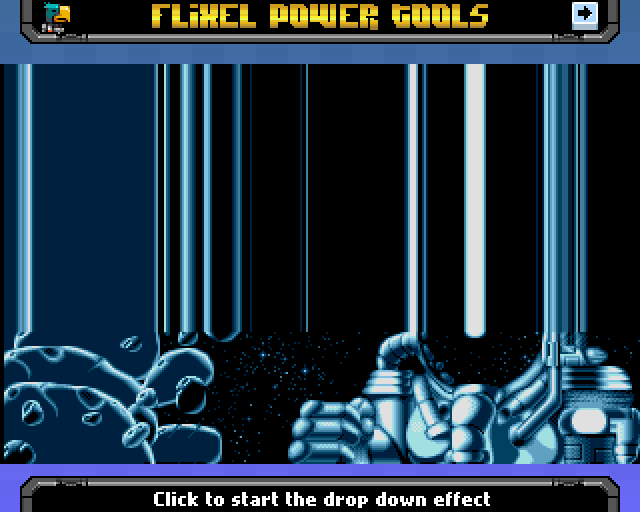 There are 5 new Test Suite examples showing how to use FlxControl, including a platformer demo (the screen shot below), a 2-player on the same keyboard demo and a simple space invaders game. I’m particularly happy about one feature in FlxControl – the ability for a “fall jump” timer. In Mario games there is a very short period of time in which you can still jump even if you’ve just fallen off the end of a platform. FlxControl lets you set that value, so your game can feature it too! You can experience it in the Control Test 2 demo. The little chick sprite can fall-jump, giving him much greater air control. Of course, it’s optional. Also updated was FlxScrollZone with a new feature that made it work better with images containing alpha data. Finally a new Special FX Plugin – DropDown, which creates a nice way of revealing a title page or other in-game element. 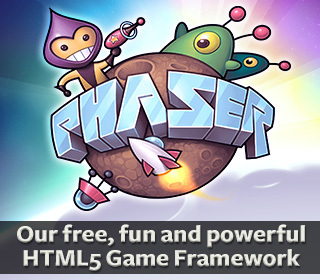 As usual grab it from github or click any screen shot to see the full Flixel Power Tools page.